The monumental street sculpture conceived by Gaetano Pesce as a critique of the patriarchy caused protests by Italian feminists. They say the artwork celebrates violence against women, the Art Newspaper reports. 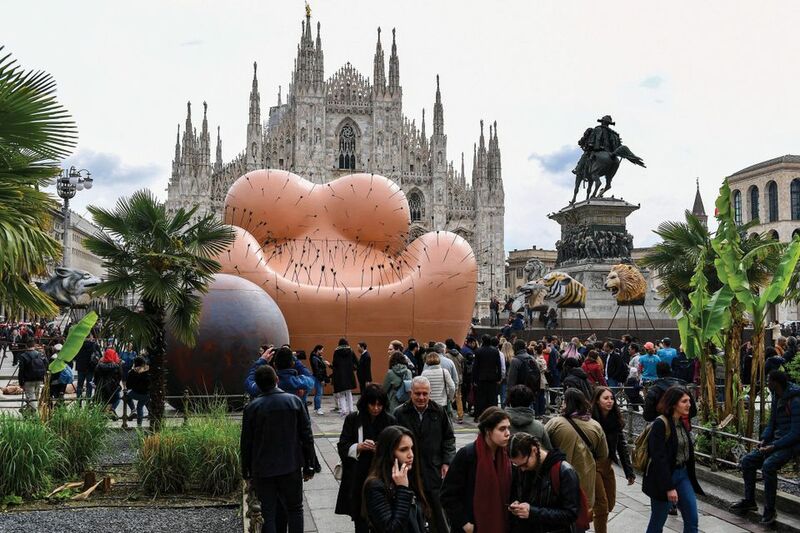 Created for Milan Design Week, the sculpture resembles a 8-metre-high woman’s torso covered with arrows, chained to a ball and under attack from wild animals. The sculpture was officially unveiled on April 7 to mark the 50th anniversary of the chair Up designed by Pesce in 1969 as an “image of a prisoner”. This time the artist portrayed a woman’s body suffering “because of the prejudice of men”. After the unveiling ceremony, the feminist group Non Una Di Meno staged a protest in front of the sculpture. Activists brought placards reading “This is not a woman”, texts by the American art activist group Guerrilla Girls and statistics showing that one woman is murdered in Italy every three days.